Jr K Jamie Fisher with one of his four field goals against Widener. 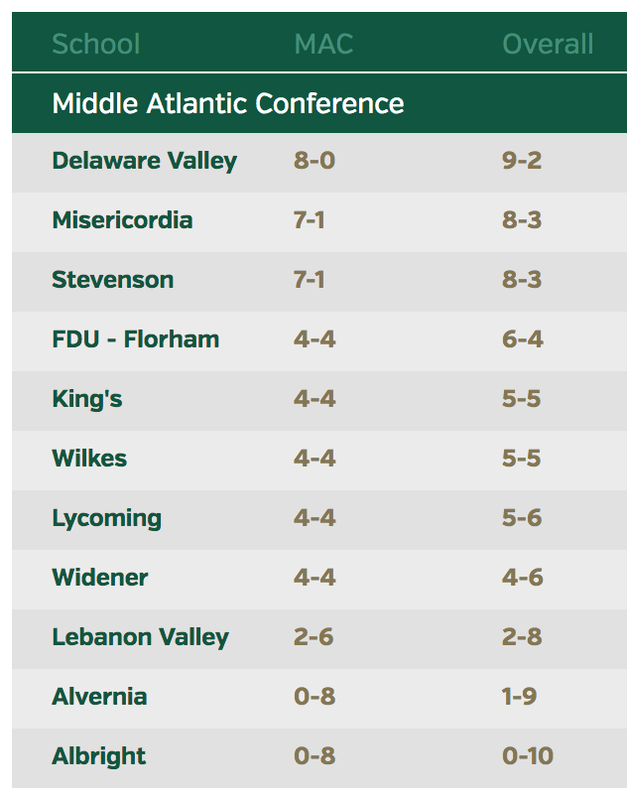 Williamsport, PA - With seven field goals in the last two games, junior Jamie Fisher has taken over the Division III lead in field goals per game. 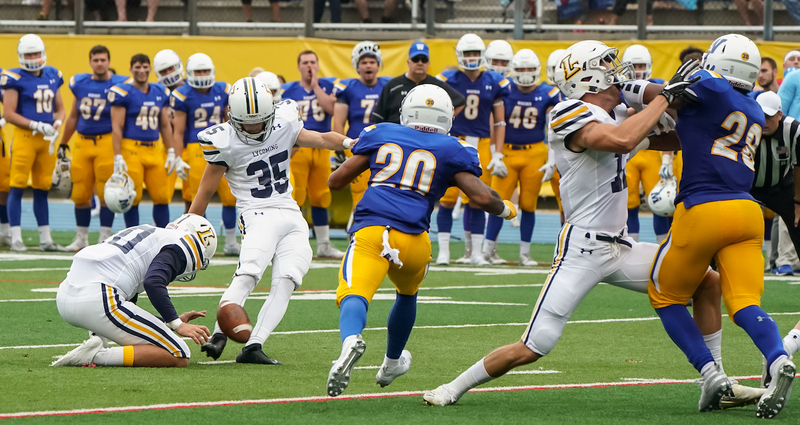 Fisher, who hit a school-record four field goals against Widener, followed that by knocking down three more against Lebanon Valley, although his run of sven straight field goals was snapped when he missed a 43-yard attempt wide with 4:01 left in the fourth quarter. Fisher, who now has 21 made field goals in his career which is good for fifth in the school's record book, has hit two of the top-10 longest field goals in program history this year and he is the only Warrior to hit five 40-yard field goals in a career. 2017: Honorable Mention All-MAC kicker … appeared in all 10 games … tied a school-record by hitting 13-of-18 field goals … made all 27 extra-point attempts … hit a 45-yard field goal against FDU-Florham, the longest in the MAC in 2017 … hit three 40-yard field goals in the season, the first in program history to do so … led the MAC with 19 touchbacks. 2016: Played in all 10 games, primarily as the kickoff specialist ... had 38 kickoffs for 2,178 yards ... had seven touchbacks, including two against Delaware Valley and FDU-Florham ... also went 1-for-2 on field-goal attempts, hitting a 37-yarder against Albright. High School: A three-time letterwinner in soccer and a two-year letterwinner in football and baseball ... hit a career-best 43-yard field goal ... earned honorable mention all-league and all-county honors as a senior ... played in the Delaware County Hero Bowl ... also earned honorable mention all-league honors in soccer as a senior.